Purchased: W Cosmetics, Westfield Garden City. First Impression: Since I’m one of those people who think that cleaning brushes is one of the most boring things ever, I’ve been looking for something to reduce the amount of baths I need to give said brushes. Enter this spray. 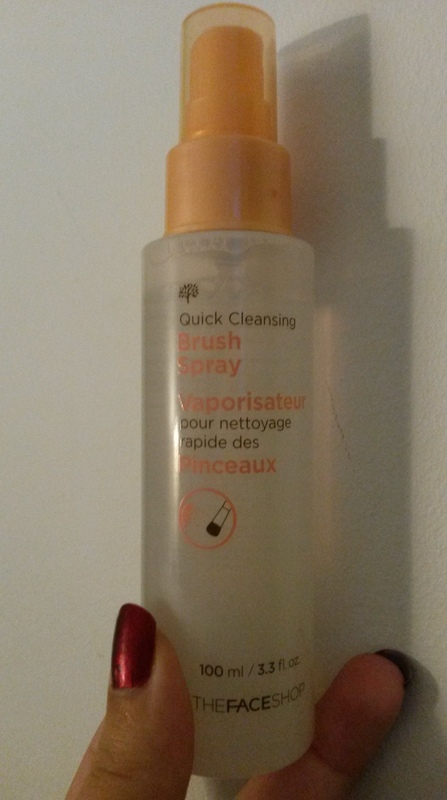 It’s a quick cleansing spray in an unremarkable bottle. As google will tell you, you spray it on your brushes after use and then wipe them on a towel until no more product comes off. Consider it makeup remover for your brushes. Or dry shampoo. Package: It’s a clear plastic bottle with some product info printed on it, nothing exciting. It lacks instructions and ingredient list in English, but they were relatively easy to find online. It’s a decent size at 100ml and it sprays pretty easily. The product itself is a clear liquid, I suspect it contains alcohol to get the job done, so if you’re hypersensitive to alcohol it’s probably something you want to look into. Usage: Quick. Easy. Gets the brushes a lot cleaner than they were before. It saves a lot of time and you just leave the brushes out to dry afterwards. Haven’t tried using this on anything except brushes but it will probably work on compacts too. Value For Money: I’ve used it a handful of times and there’s still a lot of product left. 100ml will take a while to use up and it’s a pretty effective product. If you’re the kind who properly cleanses your brushes after every single use, this is obviously something you don’t need. However, if you’re like me and tend to push it with brush cleaning, this product is probably for you. Would I buy this again? Quite likely. It’s either that or going back to using single use sponges. Western Brands for Korean Trends? Korean Brands for a Western Look?